Old Testament - Job chapter 28 is incredible! It could be my favorite chapter of Job so far this year. I kind of forgot about this chapter from my previous readings of this book. It seems to me to a large degree this chapter builds up and gets at one of the most important points in the Old Testament Wisdom / Poetry Books (Job, Psalms, Proverbs, Ecclesiastes, Song of Solomon) in the closing verse 28 of this chapter: "And this is what God says to all humanity: `The fear of the Lord is true wisdom; to forsake evil is real understanding.'" Beautiful! We do hear this theme over and over again in the other Wisdom / Poetry books of the Old Testament. It is a powerful and true point. I love the way Job builds up to this point early on in this chapter 28. Verses 12 through 14 I found to be particularly great: ""But do people know where to find wisdom? Where can they find understanding? No one knows where to find it, for it is not found among the living. `It is not here,' says the ocean. `Nor is it here,' says the sea." So, how about for you? Where do you find wisdom? Where do you find understanding? 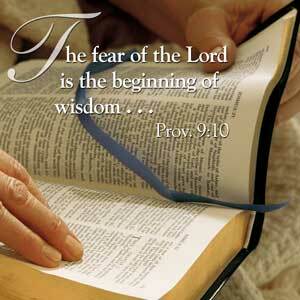 What does it mean to you that the fear of the Lord is true wisdom? Do you believe this is true? Do you believe that forsaking evil is real understanding? 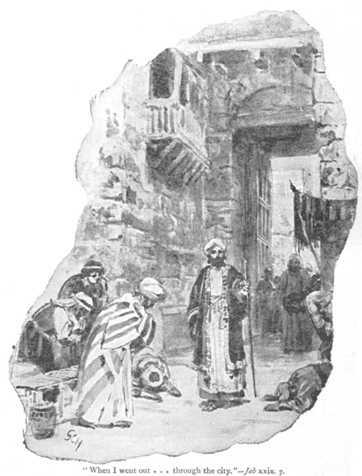 In Job chapter 29 today we read about his former blessings, including these in verses 7 through 10: "Those were the days when I went to the city gate and took my place among the honored leaders. The young stepped aside when they saw me, and even the aged rose in respect at my coming. The princes stood in silence and put their hands over their mouths. The highest officials of the city stood quietly, holding their tongues in respect." New Testament - I absolutely love and appreciate Paul's words today in Second Corinthians chapter 2 verses 14 through 16: "But thanks be to God, who made us his captives and leads us along in Christ's triumphal procession. Now wherever we go he uses us to tell others about the Lord and to spread the Good News like a sweet perfume. Our lives are a fragrance presented by Christ to God. But this fragrance is perceived differently by those being saved and by those perishing. To those who are perishing we are a fearful smell of death and doom. But to those who are being saved we are a life-giving perfume." What great imagery! 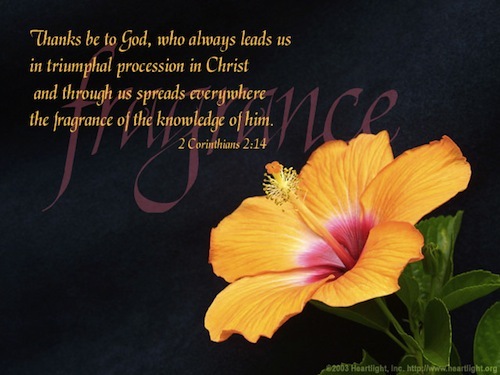 Our lives are a fragrance presented by Christ to God! I love it. It does get sad - but true - in verse 16 when Paul says that to those who are perishing we are a fearful smell of death and doom. Why do you suppose this is? I think it because when someone is living their life completely enslaved to sin and they encounter the light - the fragrance - of the Gospel, they either will embrace it or push it away. Unfortunately I am afraid some folks - perhaps even us in our past - are so enslaved to sin that the sin literally makes us fear / flee from the light and fragrance of the Gospel. Unfortunately sin can ensnare someone such that the Gospel is the fragrance of death and gloom because that is where the sin is leading someone who is enslaved to it - to death and gloom. Sad... and this reminds us of how urgent it is for us to pray for others who are enslaved to sin. Let us pray the fragrance of the Gospel and the grace of God will turn them back toward the Savior of the World who can free them forever - Jesus Christ. Jesus - is there a name more fragrant? Bible.org's commentary on today's readings in Second Corinthians titled "The Sufficiency of God Through his Spirit" is at this link. 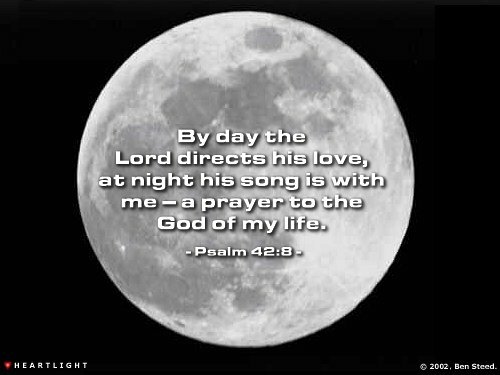 Psalms - Today we read Psalm 42 verse 1, which is one of my favorite verses in the Bible! "As the deer pants for streams of water, so I long for you, O God." That is so right on. Lately these days I have been longing for God more than ever - and I love that. I am thankful for that. There have been seasons in my life - which can certainly be called "dry" seasons - where I have not longed for God. Where I have not longed for the true Living Water. I just love the picture this Psalm verse paints in my mind - a deer in the wilderness is fleeing from hunters. It is literally dying of thirst as it runs. It is tired. It is weary. It is running from death. And it needs water. It pants for streams of water. Like this deer, I pray that I long for God in the same way. As I flee from sin. As I am tired. As I am weary. As I run from death. I need God. I long for God. How about you? 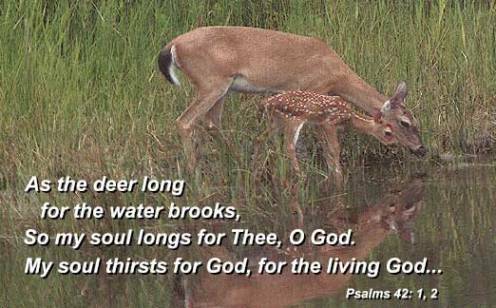 Do you long for God these days as a deer longs for water? Are you consistently drinking from the true Living Water? Worship God: Our Second Corinthians readings today reminded me of the Delirious song "Majesty." I had the good fortune to worship to this song with Delirious a few years back just before it was released. They were playing some of their "new stuff" and this was a great song to worship to live! You'll notice the crowd in this video is definitely worshiping. Do you know our Majestic Lord? Click here for your Majesty! Prayer Point: Pray that your soul is panting for God today. Pray that your soul pants for God as a deer pants for streams of water. Pray that your soul is panting today for Living Water, our Lord and Savior Jesus Christ! Comments from You & Questions of the Day: What verses or insights stand out to you in today's readings? Please post up by clicking on the "Comments" link below! I can certainly see why it is said that the love of money is the root of all evil. Once you acquire wealth or goods purchased with it, there is a never ending thirst for more. You will never have your fill of earthly desires. Those who choose God over money will one day acquire heavenly wealth beyond measure. As it says in Matthew 6:19-21 Do not store up for yourselves treasures on earth, where moth and rust destroy, and where thieves break in and steal. But store up for yourselves treasures in heaven. vs 21 For where your treasure is, there your heart will be also. How easy it is to be obsessed and allow ourselves to lust after earthly possessions. In the long run these possessons leave us cold and empty. Storing up treasure in heaven is not limited to tithing but is accomplished by all acts of obedience to God. There is a sense in which giving money to God's work is like investing in heaven. But our intention should be to seek the fulfillment of God's purposes in all we do, not merely what we do with our money. Psalms 37:21 The wicked borrow and do not repay, but the righteous give generously. Another important biblical truth. Psalms 119: 36 says "Turn my heart toward your statutes and not toward selfish gain. In Proverbs 19:1 it says "Better a poor man whose walk is blameless than a fool whose lips are perverse. What Proverbs 19:1 is saying as follows: A blameless life is far more valuable than wealth, but most people don't act as if they believe this. Afraid of not getting everything they want, they will pay any price to increase their wealth (to obtain more goods) cheating on their taxes, stealing from stores or employers,withholding tithes,refusing to give. But when we know and love God, we realize that a lower standard of living or even poverty is a small price to pay for personal integrity. Do your actions show that you sacrifice your integrity to increase your wealth? 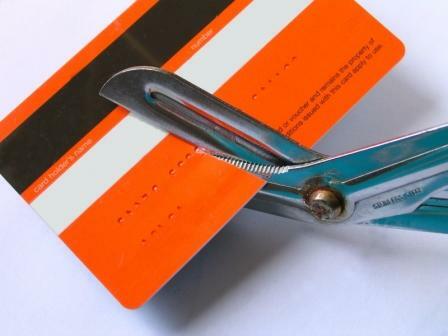 What changes do you need to make in order to get your priorites straight and to perhaps get out of debt. This advice is for myself, since I too fall short in this area. Thank you God for your word and wisdom. Government leaders, businesses, families even churches get trapped into thinking money is the answer to every problem. We throw money at our problems. But just as the thrill of wine is only temporary, the soothing effect of the last purchase soon wears off and we have to buy more. Do we see ourselves here? Scripture recognizes that money is necessary for survival, but it warns against the love of money (Matthew 6:24, 1 Tim 6:10; Heb 13:5) Money is dangerous because it deceives us into thinking that wealth is the easiest way to get everything we want. The love of money is sinful because we trust money rather than God to solve our problems. Those who pursue its empty promises will one day discover that they have nothing because they are spiritually bankrupt.